The blog tayloronhistory.com first appeared on the internet in 2011. 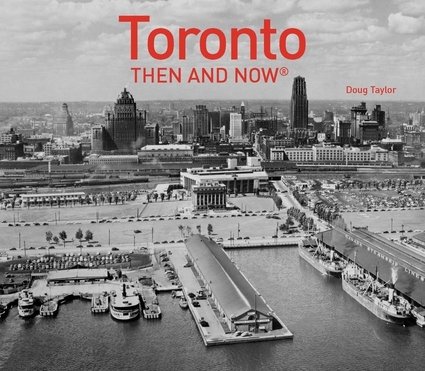 Since its inception, over 800 posts have been published that explore the Toronto’s history and its heritage structures, including those that have been demolished and lost forever. The blog’s purpose is to generate an interest in our city’s past and its historic buildings, to prevent remaining heritage sites from being destroyed by developers or indifference on the part of the civic government. During the past few years, Torontonians have become more aware of the importance of preserving the past, but the laws remain weak and ineffective, so our architectural heritage continues to disappear. As a result of the blog, three books have been published about the topics that have appeared on it: Toronto Theatres and the Golden Age of the Silver Screen (published by History Press), Toronto’s Local Movie Theatres of Yesteryear (Dundurn Press), and Toronto Then and Now (Pavilion Press). The latter two books will be available in the spring of 2016. Over 130 posts posts relate stories about the city’s old movie theatres. They include archival and modern photos that depict the theatres’ grand facades, marquees, auditoriums, and lobbies. There are also present-day images of the locations where the theatres once existed. The great movie palaces of the early decades of the 20th century (e.g. Shea’s Hippodrome, Pantages, Victoria, Tivoli etc.) are explored, as well as the more modern film palaces such as the University and the Odeon Carlton. The following is a link to the posts about the old movie theatres of Toronto. Several streets that possess timeless qualities have been researched. They harken back to the more tranquil days of the 19th century. Below are the links to access the posts about these unique avenues of downtown Toronto. Three of the greatest disasters that Toronto suffered are chronicled on the blog. In 1914, the “RMS Empress of Ireland” sank in fourteen minutes in the icy waters of the St. Lawrence River. More passengers lost their lives than on the Titanic, yet few Canadian know about this maritime tragedy. Many of those who perished were from Toronto. In 1949, a lake steamer named the “S S Noronic” caught fire in Toronto Harbour and 122 people lost their lives. In 1954, Hurricane Hazel flooded the Humber and Don Valley, and over 100 drowned in the flood waters. Below are the links to read about these events. Snow storm of December 1944, the largest amount of snow to ever descend on Toronto. Doug Taylor was a member of the faculty of the Lakeshore Teachers’ College (York University) and the Ontario Teacher Education College, where he shared his love of history with promising young teachers-to-be. During the 1970s, he conducted walking tours of Toronto’s historic districts for university students, during the days when such tours were rare. He also led tours of Chinatown, the Kensington Market, and the Necropolis Cemetery. Now retired, he lives in downtown Toronto, within walking distance of Toronto’s historic neighbourhoods. Since retiring, he has written ten books, all of them employing the history of his native city as either the subject or the background for the story. He continues to promote the history of the city he loves through his books and his blog. He can be contacted at tayloronhistory@gmail.com. The publication entitled, “Toronto’s Theatres and the Golden Age of the Silver Screen,” is one of the books that was written incorporating the research material from this blog. It explores 50 of Toronto’s old theatres and contains over 80 archival photographs of the facades, marquees and interiors of the theatres. It relates anecdotes and stories by the author and others who experienced these grand old movie houses.